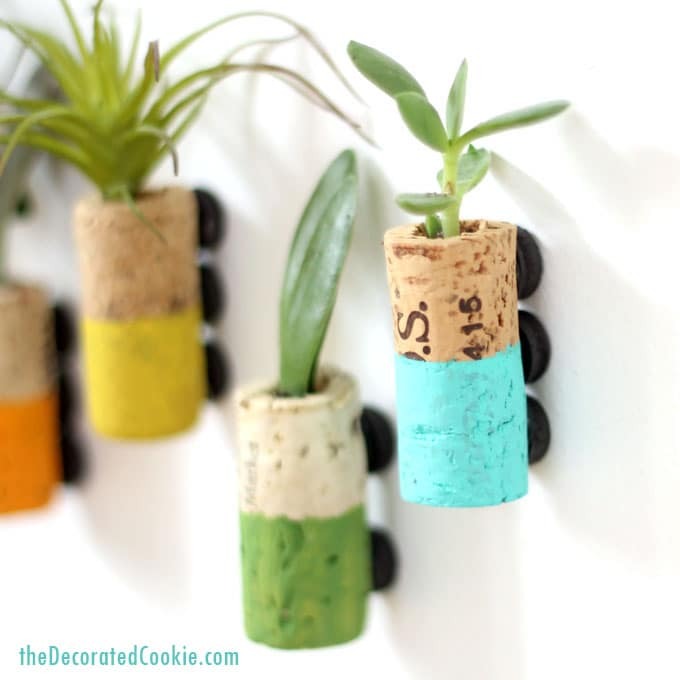 These cute and colorful wine cork succulent planter magnets make your refrigerator way more charming. 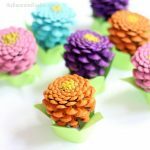 Even not-so-green thumbs can easily makes these. I have a confession. I’m a terrible gardener. Not just “I don’t grow things well,” but, as I walk by a plant, it starts to wilt. My husband doesn’t even trust me to water our own garden when he goes out of town. And by “our garden,” I mean, “the garden he grows.” How much water? Too much light? Too little light? Shade? No shade? Perennial? Annual? I won’t remember. I have no explanation for this deficiency. Gardening is just not in my bones. But I hear these succulent things are pretty hardy, so maybe they can survive with me around. And they are all the rage, right? So what could possibly go wrong? Especially when you add wine. While I may not be a gardener, I’m a great wine drinker, so I have plenty of wine corks on hand for this project. And I’m all about the DIY kitchen crafts. Drill cavities in the wine corks first. Choose whichever size drill bit works best with your wine corks. That is, the bit that is big enough to drill a cavity, but not so large to crumble the edges of the cork. I used a size 5/16-inch. 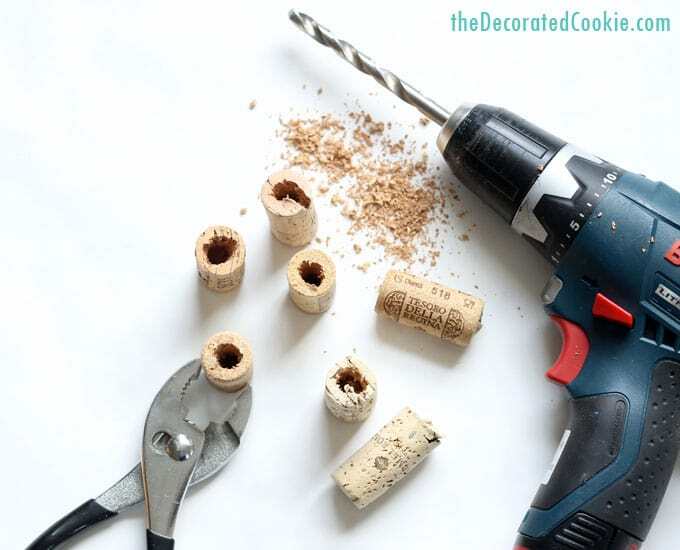 Hold the wine cork with the wrench and drill a hole in the center of the cork. (I’m making you use a wrench so you don’t accidentally drill your fingers. No injuries on my watch, please!) You may need to drill two or three times to get a good size cavity. Be sure to only drill about three quarters of the way down the cork. 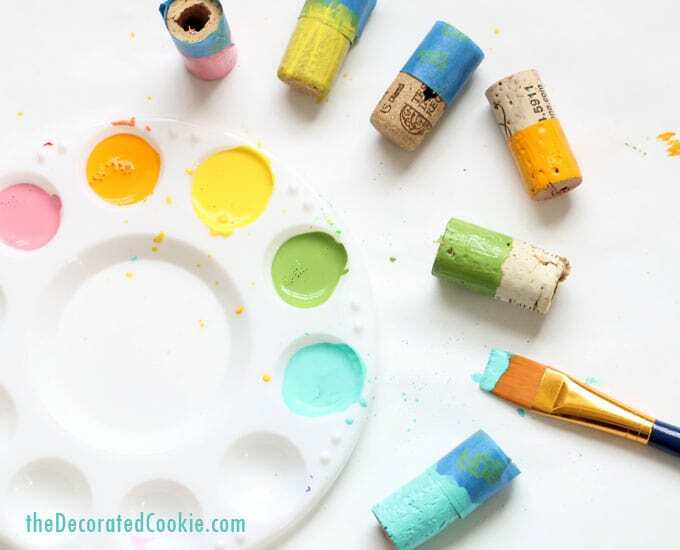 Shake out any of the cork dust. 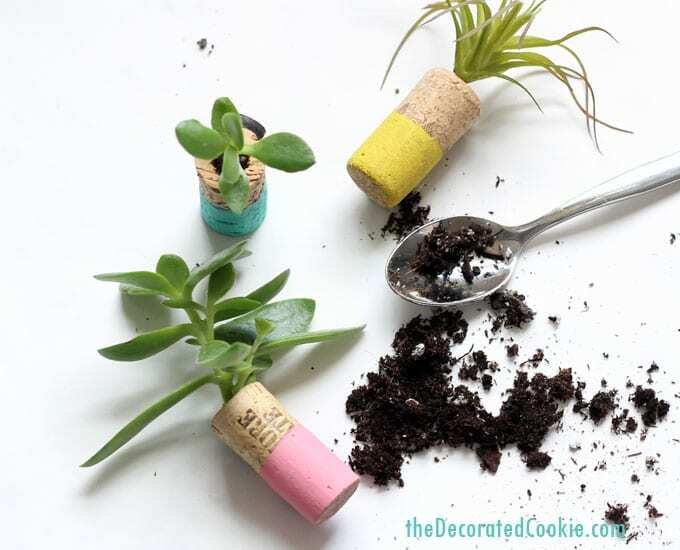 Add your succulent and soil and adhere to a magnetic surface. 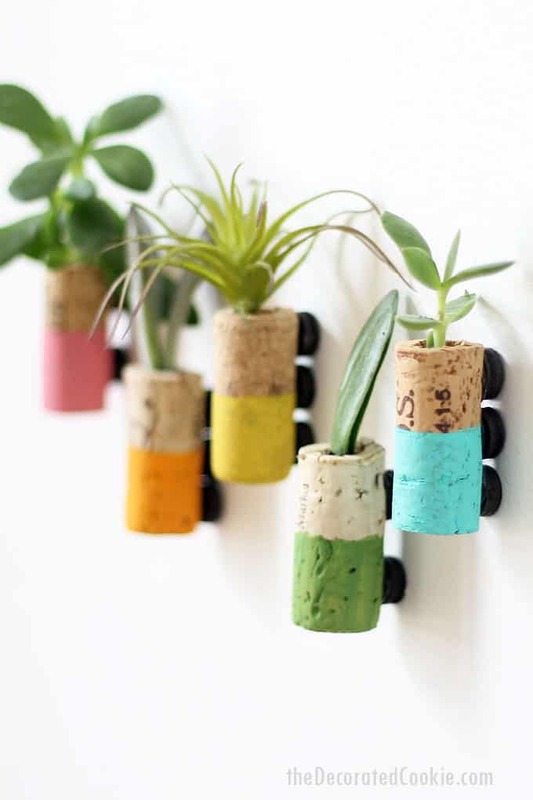 I love my little rainbow of wine cork succulent planter magnets. Maybe this will give me the confidence to tackle some real gardening. 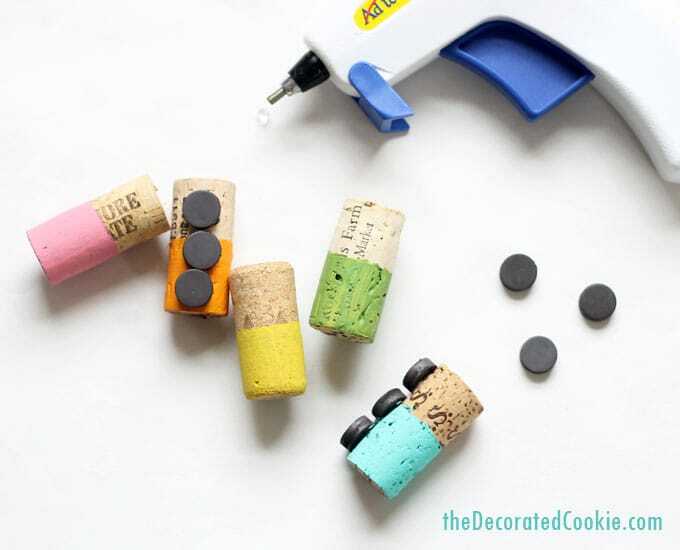 (Husband enters, waving hands wildly and vigorously shaking his head, “NO!”) The wine cork succulent magnets how-tos also appear on Crafts by Amanda. I made these for myself and my friends , but they mostly withered and died because my fridge didn’t have any sunlight coming into the kitchen. 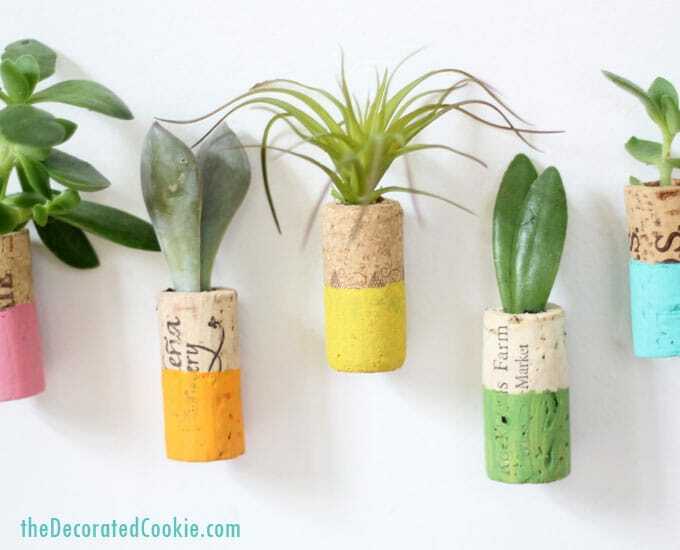 I’m wondering if using an air plant and rocks instead of soil would work next time! Hi Monique! Aaah, I have so little knowledge when it comes to growing things, but it sounds like you would be right! I hope so! Brilliant! 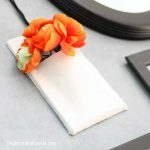 I don’t have a green thumb, so that’s the kind of thing I would never have thought of! Looks amazing, thank you so much Nichi!